3: Come to the library today, sit down with the student representatives and hear the students concerns. Well, TCD students have been at the forefront of many ideological campaigns recently, so I'm sure that everyone will support the students in their demands for more services from the college. Pages not wages? What a slogan. The temporary library jobs are not having their contracts renewed, which, besides job losses, puts enormous pressure on the full-time permanent staff. The permanent staff have had more than a 10% cut in real wages since last year. Instead of insulting the staff would it not have been more productive to have supported them during the recent strike? Where were the Student Union then? Probably gazing at their navels. That's a really petty attempt to address the issue. No one has insulted the staff of the Library. The terms of the strike which the SU handed out to the library staff, security and Junior Dean all explicitly support the library staff. You've also completely ignored the massive budget cuts that will decimate resources which are essential to students. I think the 'pages not wages' slogan is directed at the Provost, who is now on par with Barack Obama. This occupation is not against the library staff, its against the cuts. Im aware of and fully support workers issues. This is a student issue and the TCD SU's actions are reflecting the attitude of the student body in Trinity. Most people want the library open on Sunday, and obviously want more opening hours. Its not the students fault there are cuts in the staff. Also, I personnaly support the workers, and showed my support and I will be out in support of the workers again this Thurs along with other students from Trinity. Please tell me how we are supposed to interpret "Pages not Wages"'? You want more pages to the detriment of wages is how everybody on campus understood it (with the possible exception of some of the people staffing the SU). Nobody supports the library budget cuts; we all want longer library opening hours; we all want more books; no student wants cuts. But sloganeering "Pages not Wages" is at best unintentionally offensive, at worst (what I suspect it is), uninformed SU navel gazing (with the added temptation of an easy rhyme). Please tell me what you understand by that phrase, because nobody I've talked to interprets it any other way. When did "everyone on campus" tell you how they interpreted this slogan? You just seem to be intent on getting in a dig at the SU rather than actually critically analysing the issue. If you read any of the articles on this topic you would understand what "pages not wages" referred to: Money was taken from student resources such as books and put towards the wages of the library staff. Among other grievances which have already been explained, it is being argued that that was a mis-appropriation. Also the provost wages of course. You haven't even justified why claiming this is a misappropriation is "offensive" or "navel gazing". You have just ignored the importance of the resources at stake here. Students' Union Education Officer, Ashley Cooke has spoken with The University Times about the next step in the campaign for better library facilities. 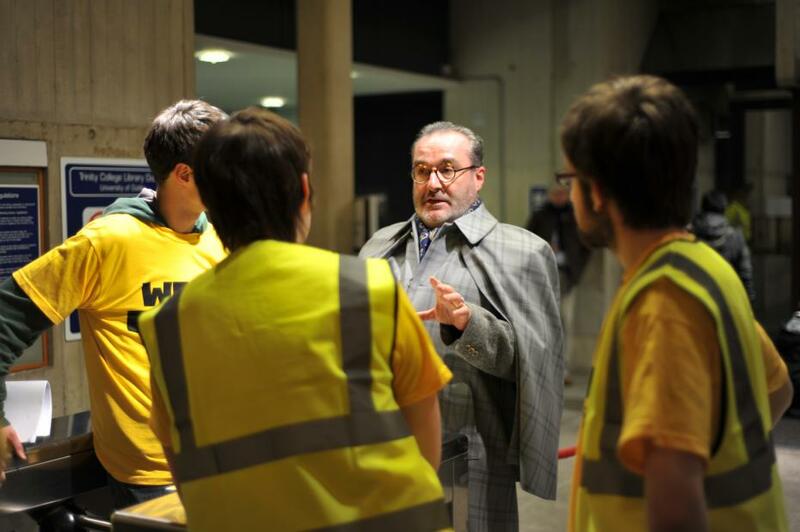 "If our demands aren't met by the end of the occupation, the Students' Union will intensify its campaign", Cooke said. Asked to specify what this further intensification would involve, Cooke mentioned that the SU had "plans for further alternative action." "We feel that college has not been taking this issue seriously, despite the fact that it is perhaps the number one issue affecting students in Trinity." Cooke anticipates communication with college authorities on this issue, either tomorrow or early next week. "Our demands are not unreasonable", he says. "We feel that the resources are available. At the same time, College have to be aware that, on our part, we will use all resources available to us to ensure adequate study facilities for our members. That is what this sit-in is about." At the moment, the Provost is refusing to talk to the sit-in protesters. 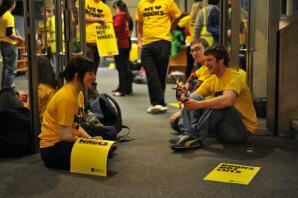 Students' Union President rang the provost's office and was informed that the provost was away. Meanwhile, the door to the library was locked at 7pm to ensure that there would be no outside interference in the sit-in. However, protesters are allowed to leave and re-enter the building whenever they want and students have been making use of this to smoke or to bring back hot food. Security arrangements for the night mean that one sabbatical officer will always be accompanying the security guard at the security desk in the library lobby. Two lists have been drawn up, both containing the names and student numbers of those involved in the protest. Both lists are being held by sabbatical officers - one outside the library and one within. These lists will not be released to college authorities. Cooke says that security have been "very co-operative." I'm well aware of the 'misappropriation'. I've friends working in the library and they were all very angry at the dig at their wages. Just ask any of them. That's how they interpreted it, and that's how most people would, and did (well, those who venture outside the SU shop). There's more chance of the second coming than the Provost taking a wage cut; and the resources that students need are not going to be funded because the SU occupied the library. It was a publicity stunt that may serve you well when you have to entertain your grandchildren, but it's ineffective. It's time for the SU to move away from populist stunts (the tricolour over TCD, promoting Coca-Cola products) and to concentrate on longer term issues, eg. long term provision for resources. Name me one librarian the SU liased with before the heroic battle of the half-a-day sit in? I'm all for resources, all for books, all for longer opening hours, but money is needed for these and most importantly the staff must come first. you have to inform people how the long term security of the library is to be realised. I pay enough for the SU charge without having to have it wasted on t-shirts and lint. first of all, I couldn't agree more about the t-shirts. I am going to bring it up with the SU, I think its an absolute waste of money. I am also going to talk to the librarians and ask them how they felt about the sit-in. 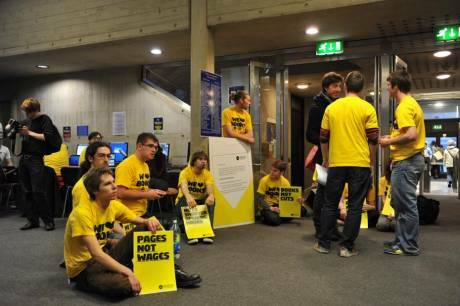 To be clear, I thought the 'pages not wages' slogan was a dig at the Provost, not the library staff, and I don't hang around the SU shop. I support the workers 100% and believe they have taken a fair share of the pain, my family has also been hit extremely hard because of this economic mess our corrupt politicians, bankers and billionaires (and many others) got us into. I don't think the sit-in was a waste of time, and I disagree that such actions should be used as a last resource as it is one of the most powerful bargaining tools the student body has. I have many problems with the structure of the USI but this was a good start to a noble campaign. Keep letting your ideas be heard. "I'm well aware of the 'misappropriation'. I've friends working in the library and they were all very angry at the dig at their wages. Just ask any of them. That's how they interpreted it, and that's how most people would, and did (well, those who venture outside the SU shop). There's more chance of the second coming than the Provost taking a wage cut; and the resources that students need are not going to be funded because the SU occupied the library. It was a publicity stunt that may serve you well when you have to entertain your grandchildren, but it's ineffective. It's time for the SU to move away from populist stunts (the tricolour over TCD, promoting Coca-Cola products) and to concentrate on longer term issues, eg. long term provision for resources. Name me one librarian the SU liased with before the heroic battle of the half-a-day sit in? I'm all for resources, all for books, all for longer opening hours, but money is needed for these and most importantly the staff must come first. you have to inform people how the long term security of the library is to be realised. I pay enough for the SU charge without having to have it wasted on t-shirts and lint." So wait, are you saying that because the Library Staff are angry that justifies the re-appropriation of money for books (which are a long term resource) to the wages of the staff? That's silly. You haven't made any attempt to justify why they should be paid at the expense of indispensable resources like books. BTW what the librarians themselves interpreted the slogan as is not representative of opinion throughout college, so that's a bit facile and partisan. Of course they're pissed, but that doesn't conclusively determine who's right on the issue. Why must the staff come first? (Also I don't know what you mean about the SU shop). All you're doing in effect is moaning about cuts whilst attenuating a political position through saying stuff like "I'm all for resources, all for books... etc." . You haven't explained how else anything could be achieved other than through this kind of activism (what you term a 'publicity stunt'). You're more concerned with constructing an identity for the SU that you can take down easily. Hence you say stuff like "it's time for the SU to move away from populist stunts", but disregard the practical effect that these kind of efforts have. The "stunt" in the library makes the college's political position - such as increasing the wages for the provost and cutting the books budget and library hours - less tenable. That means that it's more likely that the college will then agree to the demands of the students. It's also silly to think that the SU would have liaised with any librarians before the sit in. That would have made it completely ineffective. "So wait, are you saying that because the Library Staff are angry that justifies the re-appropriation of money for books (which are a long term resource) to the wages of the staff? That's silly. You haven't made any attempt to justify why they should be paid at the expense of indispensable resources like books. BTW what the librarians themselves interpreted the slogan as is not representative of opinion throughout college, so that's a bit facile and partisan. Of course they're pissed, but that doesn't conclusively determine who's right on the issue. Why must the staff come first?"
. For all your talk off critical analysis you seem to totally miss any sort of class analysis, sense of strategy, tactics and most importantly solidarity. Your comments seem to be contradictory to what Conor is saying which highlights the need for a notion of shared struggle between the library staff (who are low paid and who's pay cuts you appear to be actively supporting and encouraging) and students. If anything you're creating a division rather than looking towards areas of commonality that both students and staff can struggle together upon. If it wasn't for your obvious ignorance it would almost seem like an ideological anti working class viewpoint on your behalf. Who says anything about staff coming first, if anything "student" is attempting to counter your students first approach in favour of a united struggle, one which, you know, might actually have a chance of winning. The library staff hold more power in the withdrawal of their labour, go slows, etc. than any symbolic protest the SU undertakes. Maybe attempt to utilise that power through working together and incorporating the SUs demands with those of the workers, i.e. more funding, opening hours, and maintaining wage levels. Any notion that the wages being referred to are the provosts and not the library staff (despite your second post/afterthought on provost wages) seems to be now gone from your comments here and isn't going to get you much sympathy. "All you're doing in effect is moaning about cuts whilst attenuating a political position through saying stuff like "I'm all for resources, all for books... etc." . You haven't explained how else anything could be achieved other than through this kind of activism (what you term a 'publicity stunt'). You're more concerned with constructing an identity for the SU that you can take down easily. Hence you say stuff like "it's time for the SU to move away from populist stunts", but disregard the practical effect that these kind of efforts have." Here's a suggestion, joint action by staff and students recognising the shared needs, demands and situation they are facing. One struggle, one fight, solidarity and all that basic stuff when it comes to taking part in a campaign and attempting to win it. Actually putting direct pressure on the provost. Seems to have slipped the minds of the SU though. "The "stunt" in the library makes the college's political position - such as increasing the wages for the provost and cutting the books budget and library hours - less tenable. That means that it's more likely that the college will then agree to the demands of the students." Well it seems your stunt in calling for wage cuts to library staff in order to fund books for students and more library hours without corresponding pay for staff is perfectly in keeping with the college authorities political position. Congratulations on that front. 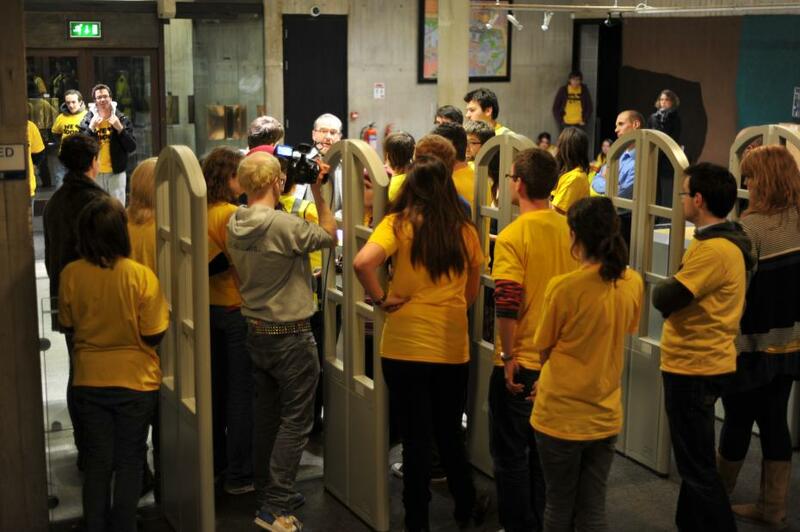 "It's also silly to think that the SU would have liaised with any librarians before the sit in. That would have made it completely ineffective." Why would that be the case at all? If you had of talked to the staff on the library floor, not the higher ups, and explained your action and how you were in solidarity with their fight against wage cuts and don't think the other library cuts have been put into maintaining their wage level (which it hasn't and I don't know where this idea comes from?) I'm sure you would have gotten an awful lot of support and may have made the action even more effective, but then that would take some critical analysis on your part, wouldn't it? Ok, for example: how does the SU want to remedy the short fall in TCD? Through the reintroduction of fees? Should fees be means tested? Should the government fund public and college institutions through a third rate of taxation on higher earners? Should it fund these bodies from indirect taxation? If so, on luxury items or common goods? Should college graduates fund colleges from subsequent wages? Should non-college goers have to pay through general taxation to institutions they didn't, or couldn't, attend? The SU haven't put forward any plan. As I've said, no one wants cuts, but what's the platform to keep resources stable or even increase them? All I and others saw were SU people dressed in inane t-shirts demanding no cuts (except to staff pay). And for the record, the majority of TCD library staff aren't even earning the average industrial wage, so yes, we should be putting them first. God knows they have to put up with a lot of crap from us TCD students. One last word, most of the librarians are very pissed off about cuts (to book buying and their wages) and would have no problem working WITH the students. They're not our enemies. I graduated from Trinity last year, so I wouldn't seek to comment directly on these events. But I did notice that the "Save Trinity Library" Facebook page makes a point of saying: "The book budget has been slashed by 650,000 Euro, while Staff pay has Increased!" The suggestion this makes, of course, is that it would be preferable to keep wages of staff low if it allows the budget for books to be increased, or at least maintained to its previous level. And you can hardly expect library staff to support such a position. Having a properly funded library would be as much in the interests of staff as, it is in the interests of students. The issue here, which it seems previous posters have been hinting at but not outrightly saying, is that students and staff in Trinity should be organising together, to oppose cutbacks and attacks on wages that affect both, rather than pulling in different directions and ultimately undermining each other. If you're going to organise politically on these issues, which is something the SU should do, then you have to be open to constructive criticism of the kind people are putting forward here. Certainly any people who organise on avowedly left-wing bases in Trinity will find themselves on the receiving end of criticism far less helpful, and far more nasty, than anything being discussed here. 'Pages not top wages' would have been clearer & read better. The students should have discussed their plans so that someone could have passed them to the authorities?